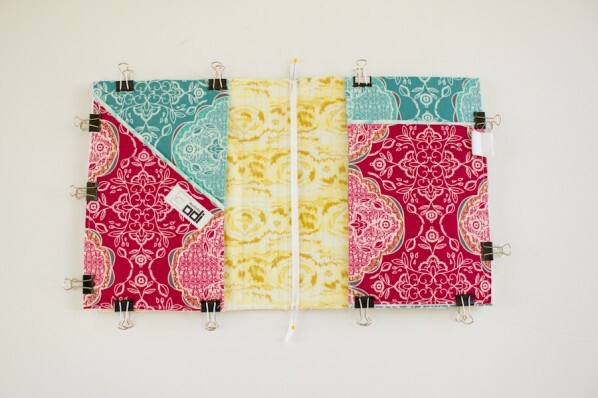 I’ve been wracking my brain all week trying to figure out what sort of sewing-blogging-related goals I wanted to set for 2013, and I’ve been coming up empty. Monthly challenges worked out so well in 2010 and 2011, but I don’t think it would be feasible with a baby due to arrive in approximately 8 weeks. Then, I thought choosing a “Word of the Year” would be fun… but somehow SURVIVE doesn’t seem inspiring or motivational. 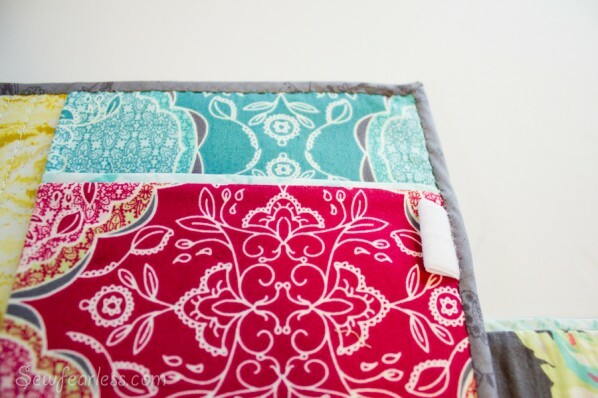 Palette cleansing projects require the very happiest of fabrics to work properly. So, I broke into my precious LillyBelle stash for this one. 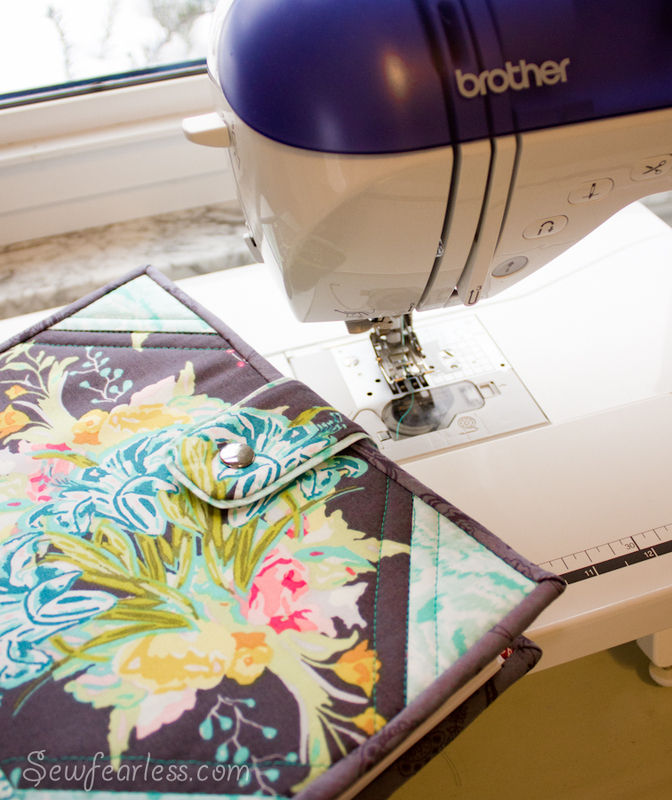 LillyBelle lends itself well to fussy-cutting and pattern matching and other sorts of thrilling sewing challenges. It was Andy’s idea to pattern-match the tab closure, and at first, I thought he was ridiculous for suggesting such silliness and I told him so. But… clearly it was meant to happen, because it did. See how perfectly it worked out? Best. Fabric. Print. Ever. Tears were shed. Big. Snotty. Sobbing Tears. Then the next morning, a bit of hand-stitching saved the day. And now, resolutions or not, I am ready for 2013. 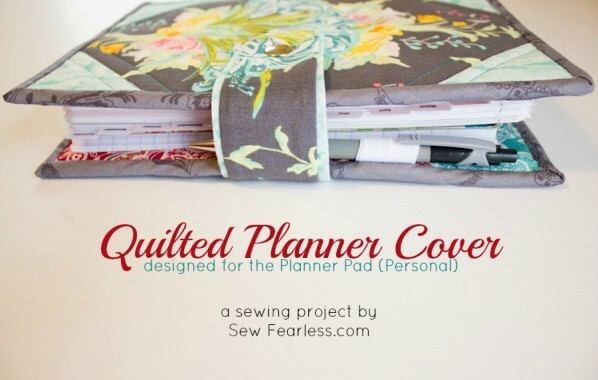 This cover is made to fit the “personal” sized Planner Pad calendar – 6 3/4″ by 8 1/2″, spiral bound. 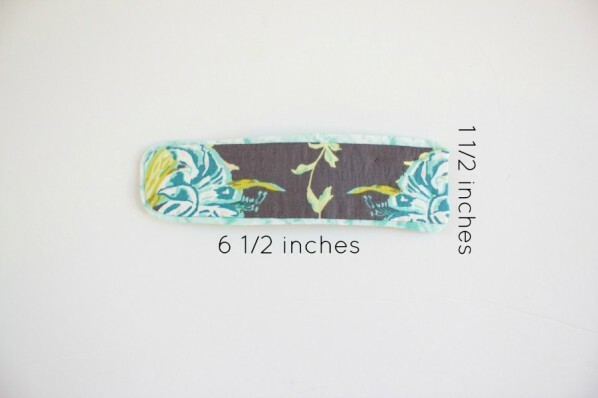 All seam allowances are 1/4 inch unless otherwise indicated. 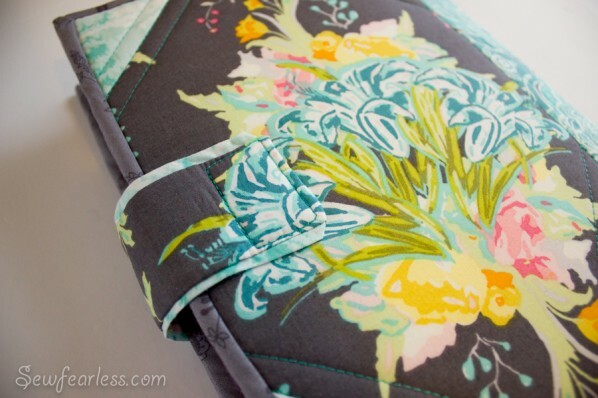 Adjust measurements accordingly for other sized planners. 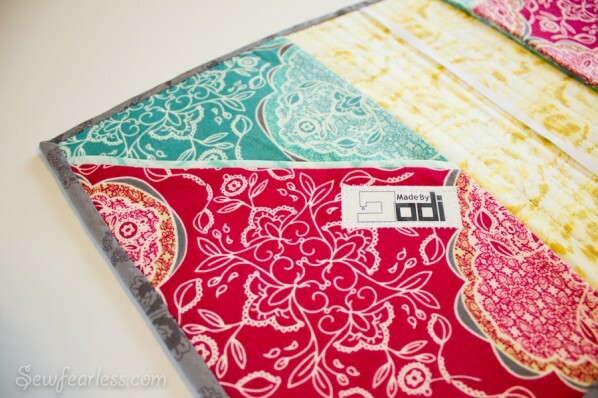 Quilt or Home dec fabrics for Outside and lining. I chose to piece together my cover outside. This looks great, but is not necessary. Step 1 – Make the Cover “Sandwich”. 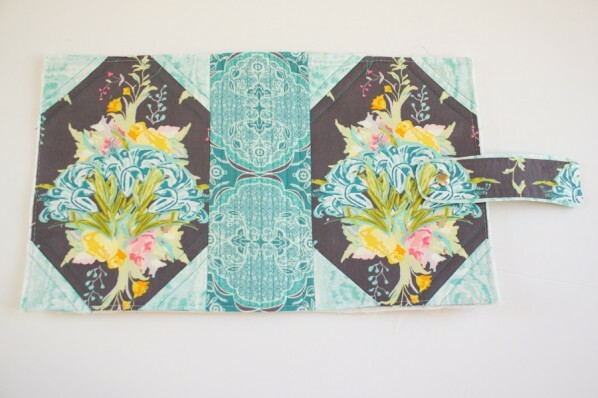 The cover is 16 1/2 inches wide by 9 1/2 high, all layers the same size. 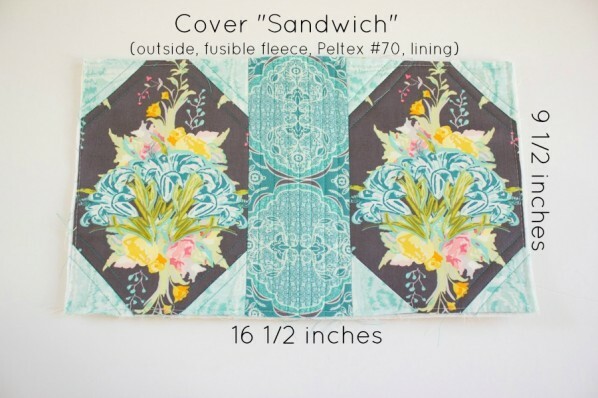 Stack up your sandwich from the bottom up as follows: lining fabric, Peltex #70, Fusible Fleece or thin batting, and the outside (which can be pieced as it is in this project). Baste the outer edges together and quilt the sandwich together as desired. 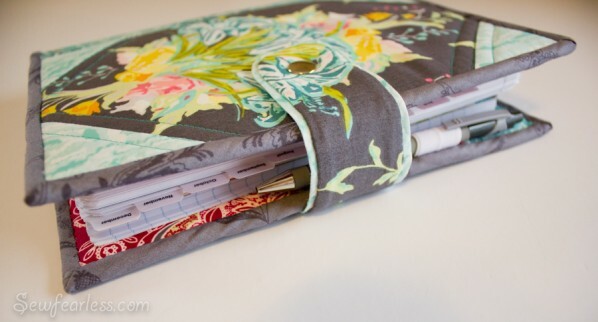 Step 2 – Make two “sleeves” for holding the planner in the cover. Start with 4 pieces of interfaced fabric 6 inches wide and 9 1/2 inches tall (blue in this project), two pieces will be the left sleeve and the left sleeve lining and the other two the right sleeve and lining. 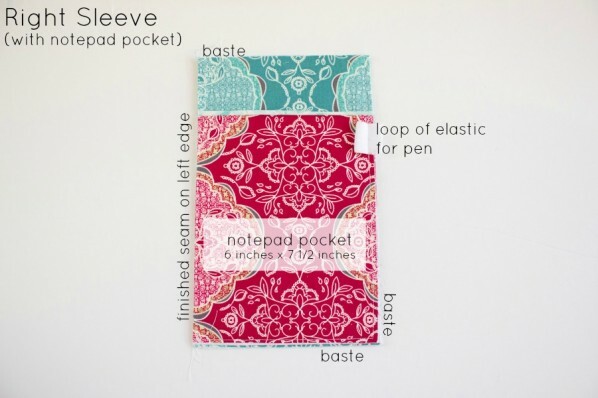 If you want to add any pockets (maroon in this project) make them first, and then attach the pockets to the sleeves before attaching the sleeve linings. Right sleeve with lining attached. For the right sleeve, sew the sleeve lining to the sleeve on the left edge, right sides facing. 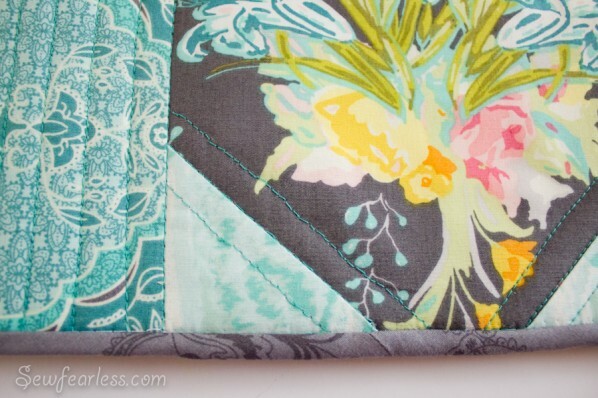 Turn right side out and press seam. Baste right sleeve to lining on top, right, and bottom edges. 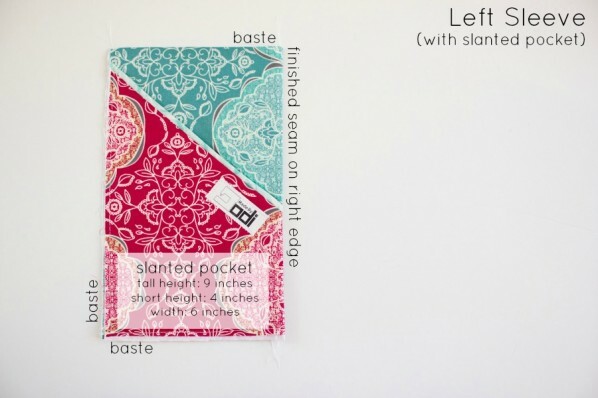 For the left sleeve, sew the sleeve lining to the sleeve on the right edge, right sides facing. Turn wrong sides facing and press seam. Baste left sleeve to lining on top, left, and bottom edges. 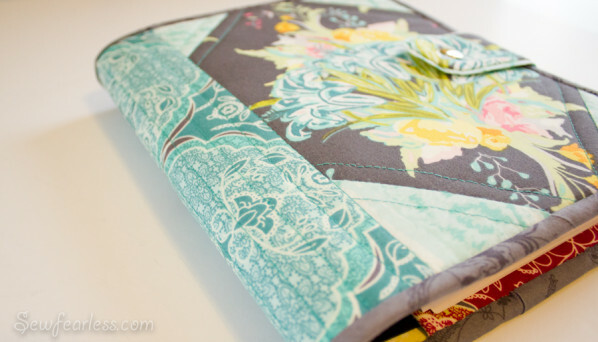 Step 3 – Make a tab closure and attach it to the cover. 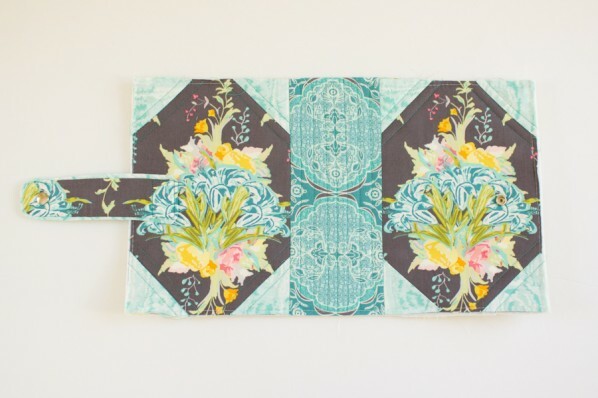 Make a fully finished tab 6 1/2 inches wide and 1 1/2 inches high. Use any method you like. I went crazy and added some accent edging to mine. Whatever floats your boat. 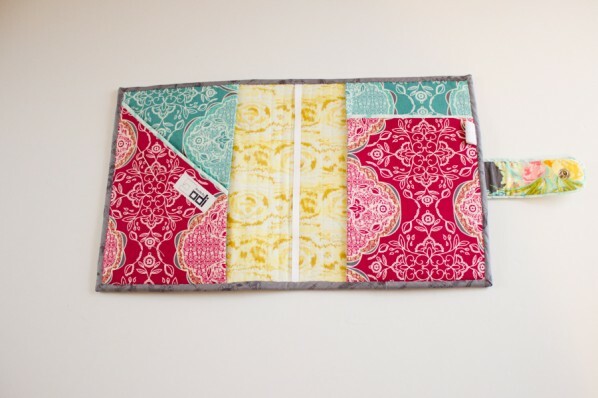 …Then, sew the other end of the tab to the back of the Cover. Step 4 – Position Sleeves onto lining side of cover; baste in place. 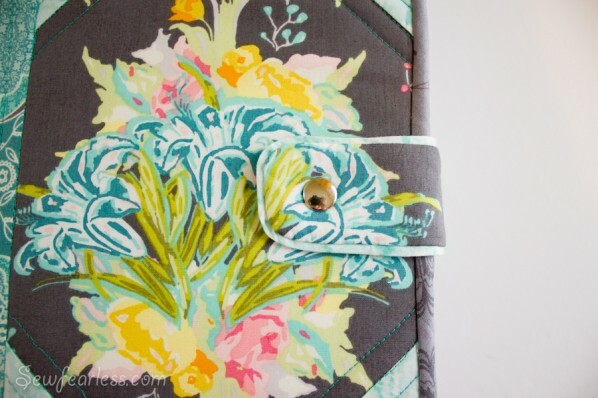 Keep the tab closure out of the way when sewing. Enjoy your planner and the New Year! Jodi it looks great. 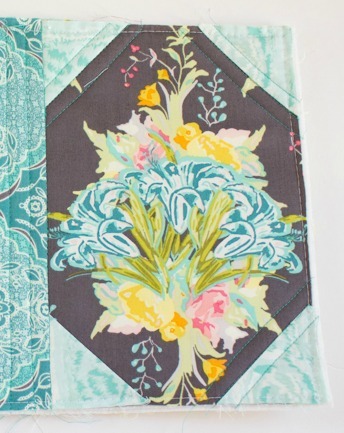 I have a thing for matching pattern to tab if possible, also making match at the seams. I do sometimes try no too but I some how just go ahead and do it. I’m glad the hand stitching worked for you, no one will be able to tell. Thanks for the pattern, you are one busy Mom. Hopefully you can do a few more projects before the cutie shows up. I’m so sad I was barfing instead of seeing you while you we’re in town! Missing you really added to the misery, but now that we are back to health, I am REALLY SUPER EXTRA looking forward to visiting you 🙂 Can’t wait! Also… Gonna be honest, it took me a couple looks to even figure out what was wrong with the first pic. Haha. It is not very noticable, but once you see it.. you can’t unsee it…. and I was hormonal and tired… and I had worked so hard on making the details perfect to have such a goof up. looks great! I didn’t realize the mistake until I saw your closeup.. and even then it took me a while to figure it out! I couldn’t even see the mistake the first 6 or 7 times I looked for it… but I did finally find it. Nice fix! This is lovely, and I LOVE your little logo tag!! I was looking for a book cover and I think that I’m gonna use this tutorial! 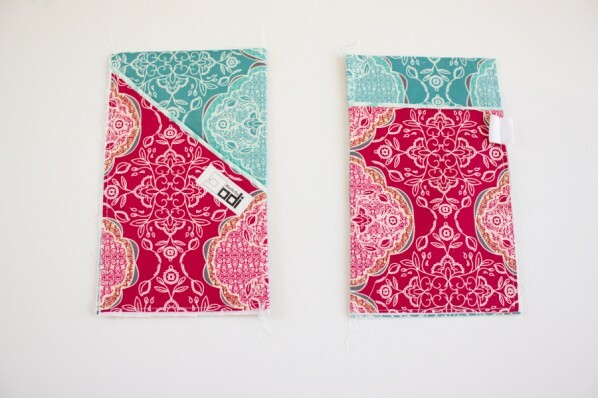 Hello, do you sell these covers? Thank you! I know this post is old so not sure if you’ll see this, but did you pre wash the fabric? I’ve heard both opinions & several that say don’t bother if it’s something you arent going to wear or wash, but thought maybe I should with the fusible interfacing. 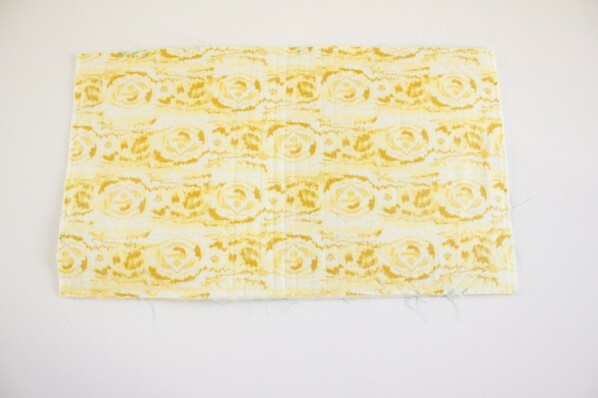 This is my first time using interfacing so I’m learning as I go with this one. For this and similar projects (like bags) that I do not launder. I do NOT prewash. I just found your blog and love it. Thank for this post. I’ve been getting into decorating my planner though I do not go all out. 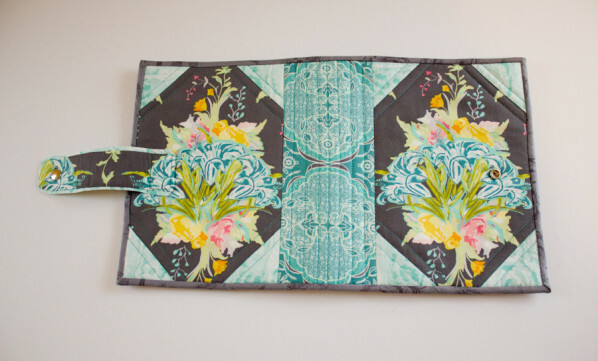 I thought of making a cover so I can change the look of my $12 planner instead of buying the expensive life planners. I’ll be honest, I’m not that busy 🙂 Thank you again!!! Hello, This is a great tutorial! I’m doing it now with some tweaks, and hopefully it will turn out as great as yours! Do you mind if I cite your blog as my inspiration when I post it on my blog?